Four years ago, the uniquely Pinot-friendly climate of Santa BarbaraCounty seemed better known to starlings and mule deer than winedrinkers. And then the Oscar-winning movie Sideways turned thecentral-California appellation into the Cabbage Patch doll of the wineworld. The public demand for Santa Barbara Pinot Noir was suddenly andseemingly insatiable: Winery mailing lists filled up, and localrestaurants like the Hitching Post II became crowded with touriststraipsing after the film's raffish stars. Even more remarkably, PinotNoir sales nationwide jumped 45 percent over the next year as winedrinkers developed a hankering for the grape rhapsodized in the filmas "the most haunting and brilliant and subtle and thrilling andancient on the planet." Of course, the groundwork for many of thesechanges was laid long before AS SEEN IN SIDEWAYS signs were postedaround the country. 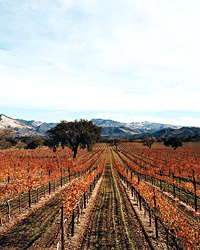 A number of important new wineries were in theworks around the time that Sideways debuted—among them Alma Rosa andJonata—and the amount of acreage under vine was at a record high.Indeed, the growth of the $500 million Santa Barbara County wineindustry has much more to do with three decades of hard work than itdoes with the success of a popular Hollywood film. A look at Santa Barbara’s post-Sideways transformation. A rundown of Santa Barbara County restaurants, hotels and wineries. Lettie Teague investigates Santa Barbara’s Bien Nacido vineyard. These e-merchants stand above the rest for ease of use and selection. Here, five wine blogs that have carved out smart and focused niches in the wine Web. Independent advice on traveling in Santa Barbara. A guide to hotels, restaurants, wineries and events from the SantaBarbara Conference and Visitors bureau. More hotels, restaurants and attractions. Publishers of a useful winery map. Travel info for Santa Barbara, as well as other U.S. wine regions.